National Audubon recently launched “Plants for Birds,” an initiative to encourage 50,000 people to plant 1,000,000 bird-friendly native plants. Alarmingly, 41% of all Neotropical songbird populations are declining; according to National Audubon, habitat loss is the number one factor contributing to this decline. Plants for Birds is an effort to help meet birds’ needs within the places that people live. Birds must be able to find food, shelter, places to raise their young and safe passage within our human dominated landscape. The average American yard does not provide many resources for birds – there is little to eat and few places to hide from predators. In a typical yard, about 80% of the plants are non-native, and over 50% of the yard is lawn with almost no ecological value. Trees, flowers and shrubs that might be beneficial to wildlife make up less than 20% of the yard. Native plants provide our native birds with fruit, seeds, nectar, shelter, and especially insect food. Native plants evolved as hosts for our specialized native insects; 90% of insects that eat plants can only eat the native plants with which they evolved. For example, our native oaks support 537 species of caterpillars, while the gingko, a popularly planted exotic, supports only 4. Exotic plants are advertised as pest-free because few local insects eat them, but they may as well say bird-free. Birds need insects: 96 % of our land birds feed insects to their young. A chickadee pair can bring up to 570 caterpillars to their nest each day. Without the native plants, we don’t have the insects; without the insects, we don’t have the birds. Exotic plants just cannot provide the needed support. Native landscaping can be a key tool to increasing bird diversity and abundance. Everyone can contribute. From planting a native plant in a container on an apartment deck, to replacing one standard ornamental with a native plant, to dedicating a section of or an entire yard to bird-friendly native plants, you will be contributing to a collective action that can add up to significant change. If you enter your zip code into National Audubon’s Plants for Birds website database you will get an overwhelming list of hundreds of native plants suitable for your area. To help narrow the focus, Onondaga Audubon is partnering with Habitat Gardening in Central NY the local chapter of Wild Ones, in a program we are calling Native Plants for Birds. Each year, starting in 2017, we will highlight and advertise 10 to 12 bird-friendly native plants. We are working with local growers who will focus on propagating these selected plants, making sure they are readily available. A dozen more plants will be added each year, the list will become substantial, and many more people will hopefully become involved in learning about and planting native plant species. Local growers providing these and many more native plants can be found in the Native Plant Shopping Guide at hgcny.org. We encourage the purchase of species, not any cultivars. Visit National Audubon’s Plants for Birds website for plant lists and tips on how to design gardens and care for plants. Tour local habitat gardens on a Show Me, Help Me tour conducted by HGCNY. Share your experiences on Onondaga Audubon’s Facebook page. 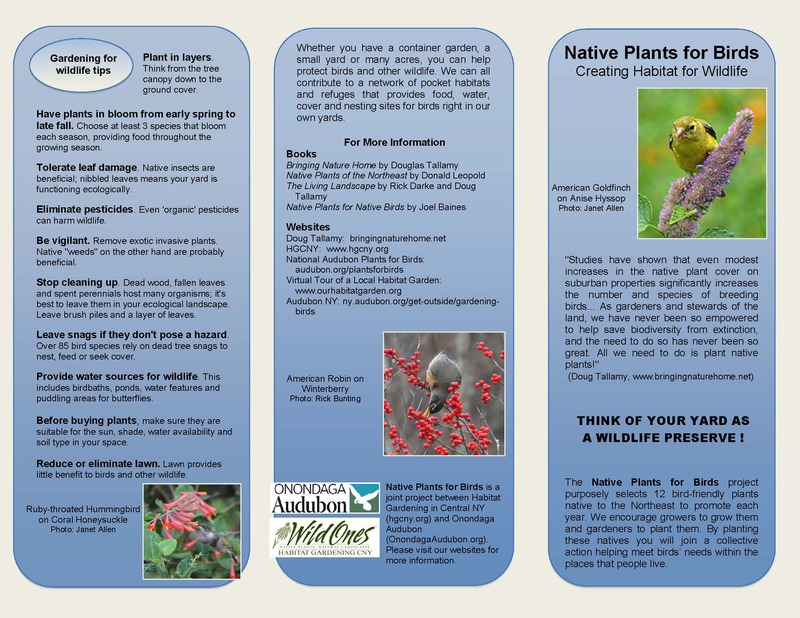 Click here for a printable PDF of this Native Plants for Birds tips flyer.